I don’t think anybody anticipated the breach of the levees. They did anticipate a serious storm. But these levees got breached. And as a result, much of New Orleans is flooded. And now we are having to deal with it and will. Well, now they have to deal with not dealing with it. 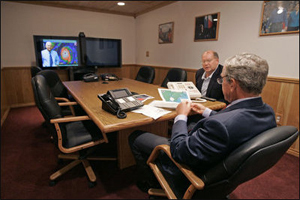 The Associated Press has released a copy of the video conference between Bush, FEMA, NOAA, and the local officials that occurred 19 hours before Katrina hit. During the meeting, Michael Brown referred to the hurricane as â€œThe Big Oneâ€ and even voiced concerns about the Superdome that sadly proved true. Very importantly, National Hurricane Center Director, Max Mayfield, warned the group and President Bush about the possibility of the levees breaching and called it a â€œgrave concern.â€ Bush asked no questions and returned to his vacation at Crawford. Watch the video at C&L and check out the story at the WaPo.